You’re looking at the world’s quickest and fastest sixth-gen Camaro ZL1. As the world’s fastest accelerating production car currently on sale, Dodge loves to brag about the Challenger SRT Demon’s in 9.65 seconds at 140 mph. Aftermarket tuners see this performance benchmark as a challenge. Remember the insanely powerful Chevrolet Camaro ZR1 to pump out over 1,000 horses? After ripping up a dyno, the tuner vowed to take the modified muscle car, dubbed the VR1100, to the track to take on the Demon. Vengeance Racing took the VR1100 to a drag strip to see what this monster muscle car could achieve. Incredibly, the 1,100-hp Camaro ZL1 ran the quarter mile in 9.58 seconds at 152.97 mph using factory 20-inch wheels fitted with Mickey Thompson Drag Radials. Yes, that means it’s defeated the Dodge Demon, albeit by a slim margin, and set a new world record for a sixth-gen Camaro ZL1. Potentially, Vengeance Racing thinks it can extract an extra two to three tenths from the quarter mile run, but time constraints prevented the tuner from pushing the VR1100 even harder. 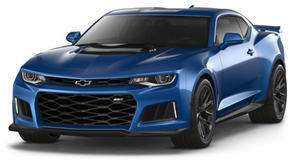 What we’re looking at here, then, is the world’s quickest and fastest sixth-gen Camaro ZL1. To achieve this blistering performance, Vengeance Racing fitted the 6.2-liter V8 Camaro ZL1 with a Procharger F-1A-94 supercharger system, an air-to-water intercooler, Vengeance Racing CNC ported cylinder head, a Stage II camshaft kit, an E85 system, and Kooks stainless steel long tube headers. When hooked to a dyno, it recorded a rating of 1,047 hp and 786 lb-ft of torque at the rear wheels. The record quarter mile run is even more remarkable when you consider that the VR1100’s extreme power is handled by the ZL1’s standard LT4 block and 10-speed automatic transmission. The tuner still hasn’t released any official performance figures for the VR1100, but judging from this Demon-beating quarter mile run, it should be significantly faster than the standard ZL1’s 3.5 second sprint time and 190 mph top speed.